This summer, as anyone who has spent 10 minutes talking to me in the last year knows, is the year everyone I know got married out of town. We were invited to weddings from Brazil, to Rhode Island, to Vancouver island and seemingly everywhere in between. It’s been an extremely fun, love filled summer. With great disappointment I had to turn down the invitation to Brazil, but I did head out to the other side of the country to go to my cousins immaculate wedding in Goat Island, RI. I will post pictures of that event soon, (and some of the cake I made in the hotel room- holy stress batman) but I made the trip a proper vacation and spend the week beforehand in Toronto hanging out with my mom. Something you may not know about me; I am a huge Mama’s girl. Huge. My Mom is woman of extraordinary strength and will, in the most understated way. She is tenacious, she is dedicated and she is almost unbearably kind. I could not adore her more if I tried. My mom lives in this amazing old house in Kensington Market, a funky old neighbourhood right downtown in Toronto, surrounded on one side by Little Italy, on another by Little Portugal, and on the other by Chinatown. There are the most wonderful produce shops, my new favourite butcher, and my Mom knows everyone by name. Which is to say we ate in and made dinner nearly every night. Which was perfect. My mom let’s me lead in the kitchen, which is cute because she easily knows as much about food as I do. This is one of her favourite summer dinners, and now it’s mine. It’s the perfect way to use up the last of summers tomatoes, and it takes only a few minutes of cooking, which means more time sitting in the backyard, having a glass of rose, and talking to your mom. 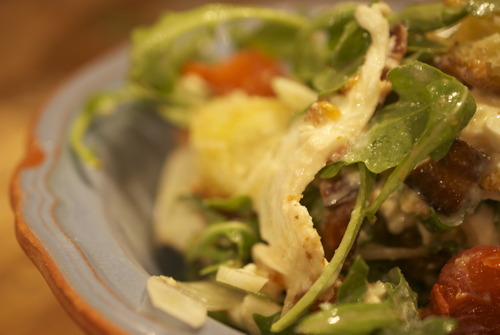 *we had burrata, the most glorious of cheeses, in the fridge so we used that, but goats cheese, or shavings of parm, or no cheese at all will be fine here. 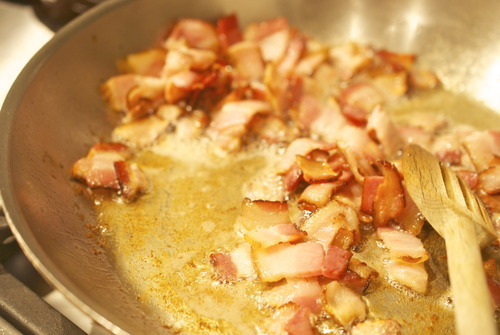 In a frying pan on medium heat fry up the bacon until crispy. Drain. 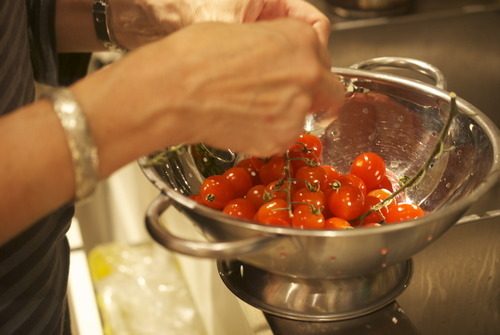 Clean the frying pan, then put back over medium-low heat. 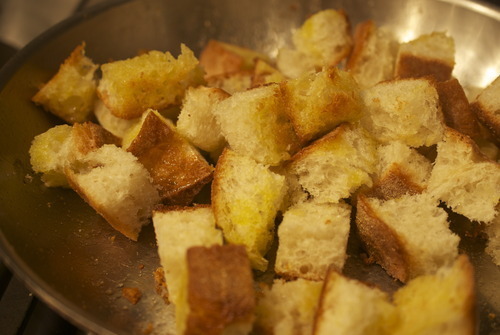 Pour in a large glug of oil and fry the bread until nice and crispy, season with salt and pepper. Put into a large bowl. 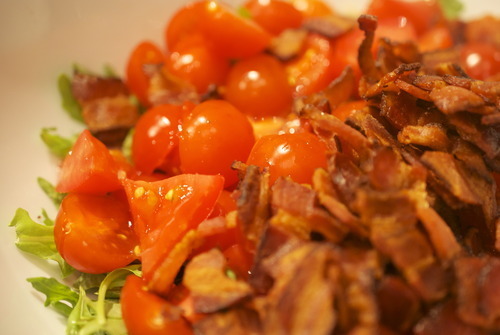 Half cherry tomatoes, tear the basil, wash the arugula and mix it all in with the bread and the bacon. Add the juice of the lemon and a bit more olive oil and season with salt and pepper. Sprinkle the cheese on top if using.